Today’s post has been motivated by a time of deep thought and reflection. Yesterday my family and all our friends said goodbye to my mother who completed the ultimate endurance race of life, when she passed away earlier this week. When I got the news that mum passed away we drove the two and half hours to my home town of Benalla to see her, and support my father as we commenced the difficult yet important task of planning her funeral. It was a long day and to be honest, a bit of a blur. The next day (despite an annoying hip injury I’m still trying to shake,) I got out of bed and said to my wife “I’m off for a run.” With a cacophony of noise from the thoughts, questions and “jobs to do”, screaming for my attention inside my mind, I needed a release. It wasn’t a long run – an easy 6km. The hip hurt and the legs were heavy, but the steady rhythm of my footsteps and breathing, the wind in my face and the familiar sense of just being – escaping from the world into my running mindset – helped me process what had happened, think about mum and reflect on life. As the trees and paths went by, it made me think how quickly a life seems to pass after it has ended when it is someone close to us; but when they are alive, you don’t expect, or can’t imagine, them not being there for you. In some ways a lot like a marathon. The distance seems insurmountable at the start of the race and at times the miles seem to click over at an interminably slow rate. But when you cross the finish line, the race seems to have passed quickly. A day or so later you’re even thinking that it wasn’t so bad – when in the middle of the race you might have been thinking “What idiot signed my up for this torture!” – and it was probably you. We often forget to embrace the race when we’re in it, and only appreciate it when it’s over. Life is a marathon. There are times during a race when you feel that you are indestructible and could run forever. At other times, you can find yourself counting down your footsteps to the next drink stop and cursing the next hill on the horizon as you push the limits of your body and mind. Life is the same. You have your good days, and your bad days. Self doubt, fear, pain, anger and despair. And then other days there is joy, laughter, pride, excitement and success. The Yin and Yang of life. During a run, it would be easy to let a blister on your foot stop you running. Or succumb to that niggly pain in your knee telling you that a DNF is ok. Or maybe it’s that stitch tearing at your side telling you that it’s impossible to go on. Sure some injuries are showstoppers that mean you can’t go on – sadly this happens in life too. But you can always gear up and go for it again in the world of running – sometimes it’s not so easy with life. Some of the perceived obstacles are simply that, obstacles – after all, what the mind believes, the body achieves. Life requires the same commitment that a marathon does, to not stop until you get to the finish line. And like a marathon – there are no shortcuts. Life is about setting goals and achieving them; overcoming obstacles; celebrating the wins; and learning from the losses; and most of all pushing yourself to be the best you can at whatever it is you want to be. I always say, “Regret hurts more than failure.” So I’m planning a life with no more regrets and I’ll cop whatever failures come my way. And when I cross my life marathon finish line – I’ll be making sure that there is nothing left in the tank and I’ve given it my all, overcoming every obstacle I can along the way – it won’t be a DNF! Because when this race is over, I can’t just sign up for another. As those of you who have followed my blog for a while will know, part of my motivation for running only my second marathon was to raise money for Alzheimer’s Australia. My mum has been fighting dementia from Alzheimer’s for a number of years and it was one way I thought I could help her. She was very proud and at the same time thought I was crazy for doing it! 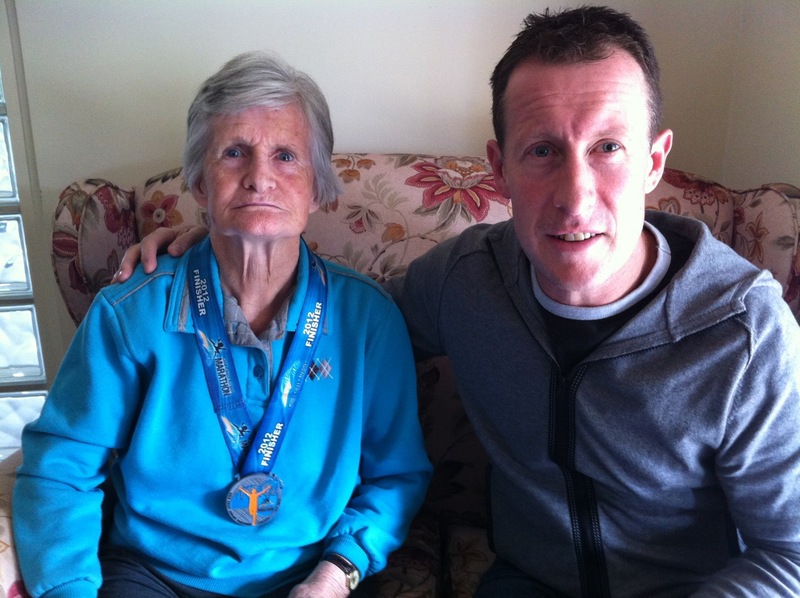 Here’s a picture of her wearing the finisher’s medal from the 2012 Gold Coast Marathon. So this week I lost my biggest fan – my support crew is minus one and it’s a gap that can’t be filled. But I won’t let the pain of losing mum leave me empty. In her lifetime, she filled all of her friends and family with joy and showed us that being kind and generous to each other was the best way for us to express our love for each other. It’s a lesson I try to live by everyday and am thankful I had her to teach me. Your family and friends are your support crew on your life marathon – make sure they know you care. Give them a hug and tell them that you love them – it will make their life marathon a wonderful one – and yours too. 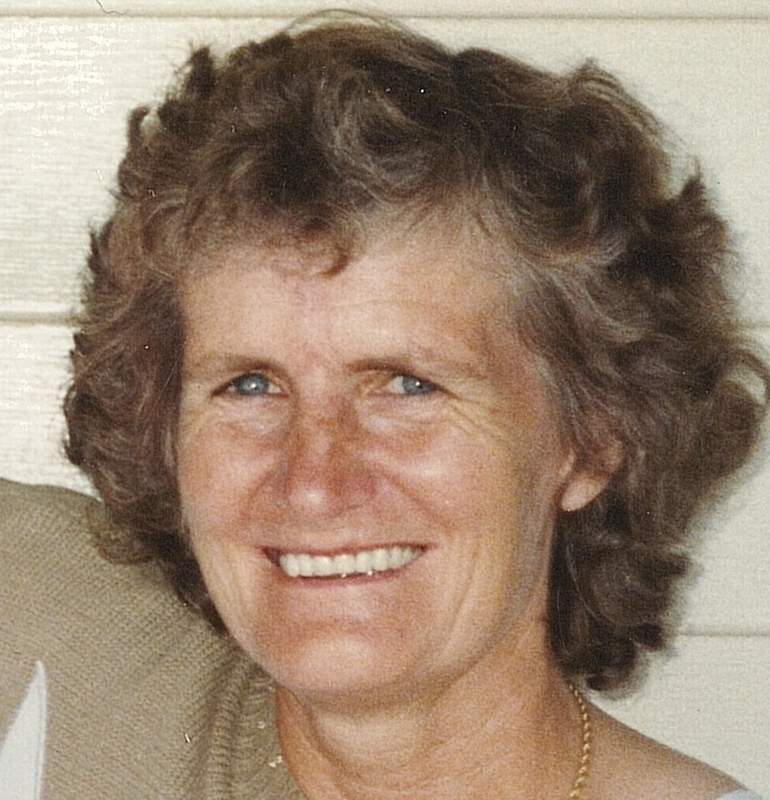 This entry was posted in Running and tagged alzheimer's, alzheimer's australia, bereavement, death, dementia, family, fight dementia, fundraising, Gold Coast Marathon, life, marathon, mothers, mum, running. Bookmark the permalink.